You may be tempted to try bleaching at home after watching a handful of Youtube videos, but please, for the love of God just DON'T DO IT. Hair color involves crazy science that is best left to the professionals. Trust me. I used boxed color and at home highlighting kits for years, and my hair got mega effed up. I found myself in salons to fix what I've done to myself more often than not, so just skip that entirely, OK? It can get freakin' expensive to maintain blonde hair! Personally, I love about an inch of dark root, but even still I find myself marching back into the salon every 6-7 weeks for a root touch up. On average, visits can be $125-$200 for a professional root touch up and toner. The initial appointment can take HOURS depending on how dark your natural hair is and what your end goal is. I've heard horror stories of dark hair taking up to 8 whole hours, and even then that individual needed a second appointment weeks later to lighten again. Since my hair is naturally a dark blonde, it takes roughly 2 hours from start to finish. Not terrible, but that's a large chunk of my afternoon! These things are amazing for use in and out of the shower. It's easier on my hair than an old fashioned brush and I find that I lose less hair when I detangle with one of these bad boys. Your hair will be drier and weaker than ever before, so invest in a good dry shampoo to touch up greasy roots and give your hair a break from washing and drying. I believe that understanding what's actually happening when you bleach your hair can either solidify or persuade your decision. More information below!!! Air dry as much as possible or use a cooler setting on your blow dryer with a thermal protectant spray. Embrace the natural texture and waves of your hair to keep damage to a minimum. DO have fun with it! ok that was a corny "Do", but you know, when done properly it can be extremely eye catching and striking on anyone! I've never gotten so many comments on my hair from men and women. It's actually become quite a conversation piece which is great news since I'm actually really awkward in real life. Your hair gets it's color from melanin which is also responsible for eye and skin color. When you bleach your hair, the bleach penetrates (heh heh) the shaft of your hair and breaks down the color molecules and removes them so they wash right out. Bleaching also breaks down the natural fatty acids of the hair shaft, which weakens and damages your hair over time. So with that being said, the goal should be to lessen the contact time of bleach on your hair AND when touching up roots, do not overlap the bleach onto our already lightened locks! This may cause your hair to break which is yet another reason to see a professional for root touch ups! Also, while we're discussing science-y things, remember this little guy from elementary school or art class? So this color wheel will help me transition to my next point of obtaining that icy, pale blonde that is so hard to achieve. Blonde hair gets hella brassy, which is not exactly pleasing to the eye. This color wheel shows that purple and violet is the exact opposite of yellow and orange tones which means these colors actually cancel each other out. The coolness of the violet works to neutralize the warm tones of orange and yellow and it cools down. Brassiness can come from exposure to sunlight, sulfates and parabens in shampoos, ocean water, minerals in water and several other things. Not to worry though, that yellow/orange color can be combatted with violet shampoos, conditioners and toners that will neutralize that yellowness. Violet Shampoo and conditioner is a simple way to banish a small amount of brassiness. 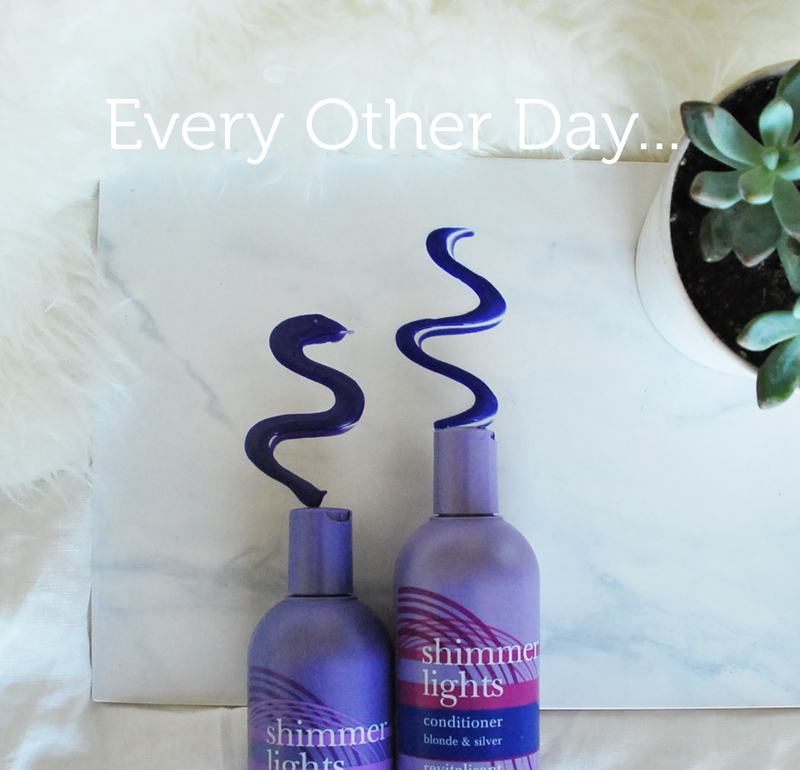 So far, my favorite combo is Clairol Shimmer Lights. This stuff is super pigmented which is great but be careful! I've stained many shower curtains, walls and even my fingernails get weird and purple sometimes. I will admit, the shampoo can be very drying if used every time you wash, but if you only use it every other wash, you're good. Also, the conditioner is extremely pigmented but doesn't condition well on it's own. If you mix one part normal conditioner with one part this one, it applies and spreads much better on showered hair. Leave the shampoo on for a few minutes while washing, and leave conditioner on for five or so. 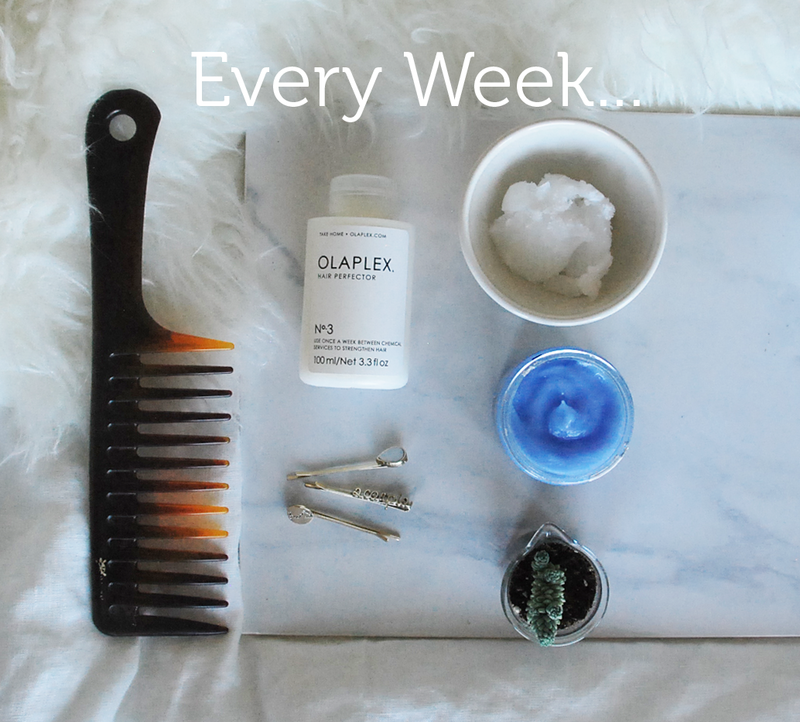 Olaplex is the holy grail for dry, damaged hair. There's a 3 step system, in case you're curious that starts off as a bleach additive (request it from your hair stylist if they carry it!) then it's applied as a conditioner POST bleaching, and finally you can use it right at home to condition and soften the hair once a week. Coconut oil is also amazing for deep conditioning! Just scoop up a good handful and evenly distribute on the ends of your hair like you're making a pony tail. Tie up off of your shoulders and leave this on for a good hour before shampooing and conditioning normally. Manic Panic Virgin Snow is a great conditioning hair mask that deposits a light blue/violet color to minimize brassiness. Work this through clean, towel dried hair and leave on for 30 minutes to an hour (or more). Baby powder is a great alternative to dry shampoo! This little guy was about $2 in the travel section of Target and I take it everywhere in case my hair gets greasy in between washings. 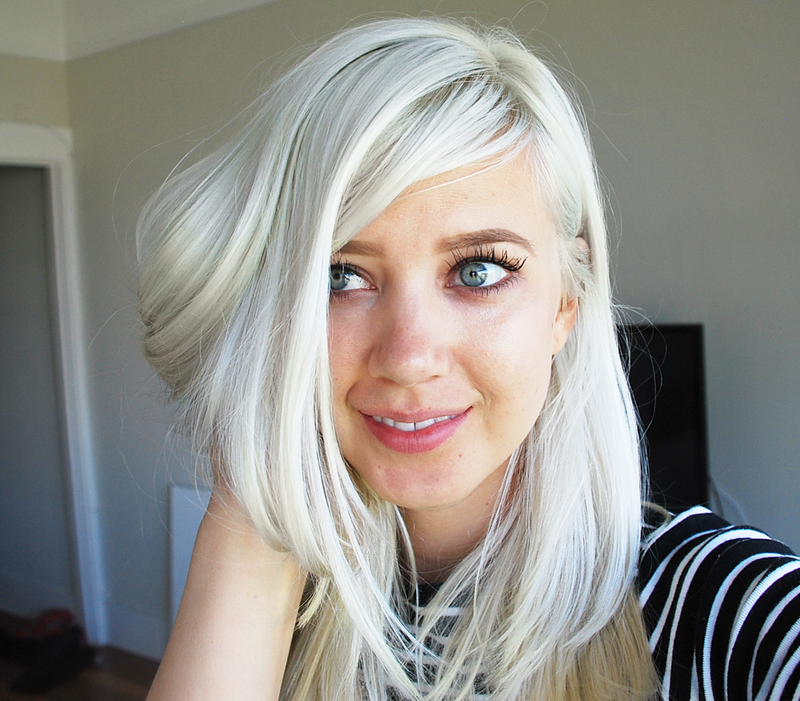 My hair is so light, the white powder blends in but still be througough like you would normal dry shampoo. Sprinkle and shake a liberal amount onto roots, or as my boyfriend would call it, "season" yourself. Rub aggressively with finger tips while concentrating on the roots, then brush out to the ends and style as usual! Works like a charm every time and it smells fresh, like babies I suppose. You know, that's pretty much all the advice I have! 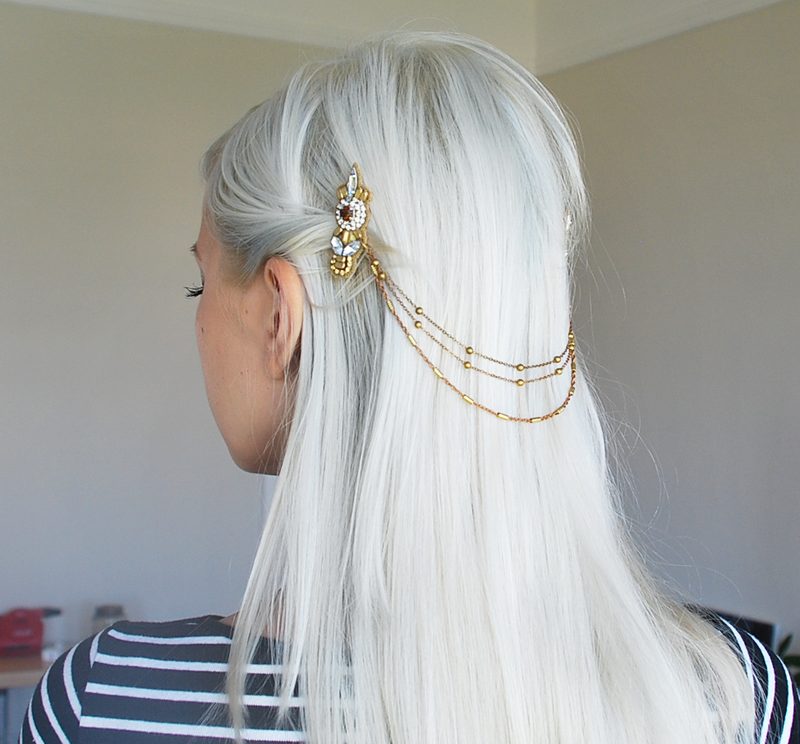 Here's a hair chain I recently purchased from Anthropologie that I was just dying to show off. Sorry, It totally doesn't even go well with my shirt because I was too anxious to show it off. Awesome post!! I did one like this recently for pastel pink maintenance. People don't realize how much friggin' work goes into having a unique hair color. Totes worth it in my opinion though. Oh my gosh! Now I HAVE to check it out! You're right, Having unnatural colors can such a maintenance nightmare but it's so rewarding in the end. I bet you get so many compliments on your cotton candy hair! How did u achieve that particular platinum color? Hi! I'm currently trying to achieve your color but in an ombré style. I'm having trouble knowing which is the right shade of bleached hair I must get to in order to dye it platinu . I'm a dark haired girl and have been gradually bleaching my hair. And very carefull . So far so good. Just need to know how much more bleaching I need done. Also what color roots do you recommend? Your color is beautifu . Hair fall solution also known hair loss. Hair is made of a type of protein called keratin. Hair is actually a modified type of skin. Hair grows by forming new cells at the base of the root. These cells multiply to form a rod of tissue in the skin. can you undo dreads I really like and appreciate your blog post.Much thanks again. Want more.